During 2013/2014, Walt Disney World has gradually been rolling out an extensive, resort-wide, upgrade of their guest-accessible technology which goes under the overall banner of “MyMagic+”. There are many other Disney-related websites which cover this in great detail, but this page should at least give Port Orleans guests a brief overview of what this new system provides and how to use it. This is by no means a complete guide though! The whole system is linked together via a website and mobile app which allow guests to plan and manage their visits, and for which the free wi-fi internet that is now provided in all of the Disney parks and hotels is proving very useful (especially for international travellers who do not want to use expensive roaming data accounts). The My Disney Experience website, or the My Disney Experience app which can be downloaded for Apple or Android mobile devices, is the main tool which guests can use to manage all of the new features that MyMagic+ provides. You can also access some features ‘on-the-day’ using terminals located within the parks. Before you start using My Disney Experience, you will need to create a Disney online account for each member of your party. If any of you already have usernames on any of the main Disney websites, you should use those. Is it perfectly possible for everyone to make their own plans independently, but it makes much more sense for one person to act as the group organiser, so you need to make sure that everyone else has given permission for that person to access their plans via the Family and Friends menu. Once everything is set up, you can link any existing hotel reservations, your pre-ordered tickets, and any dining reservations (ADRs) onto your account, and then manage them online or via the app on your mobile device. You can also make new bookings, reserve restaurant and FastPass times in advance, plan your daily itineraries, customise your Magic Bands, perform online checkins for the hotel, etc. You can even access your PhotoPass pictures after your trip. In short, it’s the central hub that lets you access and plan your whole vacation experience, so take some time to explore and understand it fully as it is fundamental to pretty-much everything else that follows. If you encounter any difficulties with the app or website you can call Disney’s technical support helpdesk for My Disney Experience, Magic Bands and FastPass+ on (407) 939-4357 (USA), 0800 16 90 749 (UK) or 1800 812 677 (IE). As of January 2014, “FastPass+” has completely replaced the old paper-ticket Fast Pass system which was used to reserve a timed one-hour slot for many of the most popular rides and attractions at Walt Disney World, thus avoiding a lot of queuing. The old machines are no longer available, you can now only use the new system. 60-day advanced window for making bookings — Currently this pre-booking facility is only available to on-site resort guests who also have theme park tickets linked to their booking, but it is expected to be opened up to Annual Pass holders and other guests soon. This is a major advantage of the new system, and the process works fairly simply via My Disney Experience website, allowing you to select specific attractions and times up to 60 days in advance — albeit with some restrictions listed below. Three FastPass+ reservations per day — You can only book a maximum of three attractions per day, although if you miss one you can reschedule it for later in the day, availability permitting. All three reservations must be for different attractions, it is not possible to book the same attraction more than once per day. One park per day — Your FastPass+ reservations are limited to one park only for any given day. You cannot even park-hop and then look to see if there are any on-the-day slots available at your second park. If you are planning to park-hop at all, it probably makes more sense to book your FastPass+ options for the second park in the afternoon/evening, and hope that the standby lines in the first park might be shorter in the morning. ‘Tiered’ attraction lists — At several parks (e.g. Epcot and Disney’ Hollywood Studios) you are only allowed to make a FastPass+ for ONE of the headliner attractions — for example at the Studios, you have to choose between Toy Story Midway Mania, Rock ’n’ Roller Coaster and the Tower of Terror. As with the one-park rule, you cannot try to book any of the other headliners later in the day during your visit either. More attractions included — This means that if (OK, when) you find that all of the slots for high-demand attractions have gone for the day, you can still make reservations for lower-demand attractions (which of course previously didn’t have long queues anyway, but presumably as people start to actually book FastPass+ reservations for them, the standby lines will start to get longer). Some parade and firework viewing spots are included now too, but are sometimes not released very far in advance. Strictly enforced return times — You are allowed a few minutes grace outside of your allocated time-frame (currently 5 minutes before and 15 minutes after) but if you turn up an hour late you won’t be admitted. In-park kiosks — The old Fast Pass machines outside of each attraction are now closed, but there are new touch-screen terminals at multiple locations around each park which allow you to book or modify your reservations. These are currently the only way that day-guests can make FastPass+ reservations, and they can build up quite a queue in themselves. Edit your reservations at any time — This can be done via the website, using the mobile app, or at the in-park kiosks. Subject to the above restrictions, and assuming there is any availability left, of course. Magic Bands have now replaced the old plastic Key to the World keycards which were used for guest room access, theme park admission, charging privileges, etc. These new customisable coloured rubber bracelets contain a tiny ‘RFID’ chip which when tapped against Mickey-shaped sensors anywhere around Walt Disney World uniquely identify the guest and thus provide access to a wide variety of services. Guest Room Access — Tap the band on the Mickey Head sensor next to the external door handle in order to open your room door. Theme Park Admission — If you have purchased Disney theme park tickets, these can be linked to your Magic Band. Just hold your band against the Mickey Head sensors at the entrance plazas at any of the theme parks, then place your finger on the nearby biometric fingerprint reader, and once the system has confirmed your identity, just walk in! FastPass+ Redemptions — Hold the band against the Mickey Head sensor at the Fast Pass return location outside most of the major attractions at Walt Disney World and (assuming you are within your pre-booked time window) you will be admitted to the attraction with a much shorter wait than the regular standby queue line. Charging Privileges — Hold the band against the Mickey Head sensors at any payment locations within Walt Disney World to charge your purchases and meals to the credit card which you originally applied to your reservation for charging purposes. For security, you will also need to enter a PIN number to verify the transaction. Restaurants have portable hand-held readers, so this can all be done seated at your table. Disney Dining Plan credits — If you are on any of the dining plans that Disney offers, you can use your Magic Band to pay for meals or snacks using your plan credits in exactly the same way that you would otherwise charge them to your room. Car Parking Access — Tap your band on the sensor at the security gate at the front of the resort to gain vehicle access without having to show any further ID to the security guard. Note: For bookings made on or after 21 March 2018, there is a $19 per night parking charge at the hotel. PhotoPass+ — You can use your Magic Band to add photos to your account when having your picture taken by any of the PhotoPass photographers around the parks, and at the character greeting locations. Also on-ride pictures can be added to your account, and it is expected that in the longer term this might become automatic as the ride systems will detect your Magic Band and know who to assign to photo to. Customise Your Bands — You can customise the look of each of your Magic Bands via My Disney Experience, choosing from seven colours and adding a name to the back. This must be completed at least 30 days before arrival to allow Disney enough time to mail the Bands out to you (US guests only; international visitors can still customise, but they will collect their Bands from the Front Desk upon arrival). 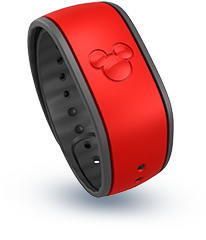 Also, while not an official Disney service, a third-party company called MagicYourBand.com provides dozens of different skins at very reasonable prices which you can apply to any Magic Band, and you can even design your own look based on your own photos or artwork. They offer free shipping worldwide, so well worth checking out. If you might have trouble using a Magic Band for any reason, you can request a duplicate credit card sized “Key to the World” card from the Front Desk, which will perform the exact same functions. It too contains an RFID chip. Note: no personal information (name, address, credit card details, etc) are stored on the band itself. It only contains a reference code number, which Disney’s computer systems use to retrieve any necessary information from their secure master database. In short, there are no privacy concerns — beyond that of Disney knowing (and no doubt logging) where you are and what you are doing on their property, but that applied to the old key cards too. From 180 days prior to your arrival date you can start to make Advanced Dining Reservations via the Disney website (or by phone) for table-service meals at the Disney theme park, hotel and Disney Springs area restaurants. As an on-site hotel guest, you get the advantage of being able to book for the entire first ten days of your stay at the same time, effectively giving you an extra 10-day window over off-site guests — which is great for the restaurants which tend to sell out quickly. The system will link your bookings to your My Disney Experience account, allowing you to view, modify and cancel whenever you wish, and you can indicate which of your Friends and Family group will be present for the meal. Note: cancellations are free up to one day before the reservation date, but if you cancel on the day (or you just don’t show up) then your credit card will be charged a $10 per person fee. Please check the cancellation windows for any reservations which require full payment at the time of booking (such as dinner shows) as the terms may vary. Up to 60 days before arrival, you can provide checkin information for your whole party in advance, including contact details and your expected checkin and checkout times. You can also assign a payment card at this point, complete with a different PIN number for each member of your party. There are some Special Request tick-boxes you can select during the process, but to be honest they are somewhat limited at present so you might be better off getting any requests added to your original booking in advance (see the Making Special Room Requests page). When you arrive at the resort, in most cases your room will already have been allocated for you — often even if your arrival is before the official 3pm checkin time — and a welcome pack (including your Magic Bands if they have not been posted to you in advance) will be waiting at a quick-pickup location located in the resort lobby. If by any chance you are not happy with the room location that you’ve been allocated in advance, you can always ask a Front Desk cast member to check again to see what other rooms might have become available in the meantime, or you could offer to wait for another room to be cleaned and be made ready if you want. Your Magic Band can then be quickly reprogrammed for your new room. There is now an additional “Direct to Room” arrival facility provided for any guests who have completed the full online checkin process and who have also received their Magic Bands in advance (so predominantly North American guests at present). This allows the resort to communicate your room number to you directly by email or text message shortly before your arrival time (assuming that a room is ready of course). You can then go straight to your assigned room without ever needing to visit the Front Desk, and your Magic Bands will be fully activated and ready for use. A generic Welcome Pack of resort information will be waiting for you in the room. The Direct to Room facility won’t suit all guests of course. If it’s your first time staying at Port Orleans then I’d strongly suggest you call at the Front Desk first — if for no other reason than to be given useful information about the resort and detailed instructions on how to find your room. And even if you have been issued with a room number in advance it can still be altered, so should you have any concerns you are welcome to talk to a Front Desk Cast Member and check in the old fashioned way if you prefer.